Durably laminated classroom wall maps measure 46" x 32" or 36" x 48". Easy to read, printed on tough non-tear material, brightly colored, and markable with dry erase or water soluble markers. Mounted on heavy duty spring roller, the wall maps are offered with steel backboard. From a map featuring possible migration routes of the first Americans to a map of the Gulf War, all maps in this series meet US history curriculum requirements. Save money and space by mounting US History wall maps together, as a set, on one spring roller-mounted wall map operation. 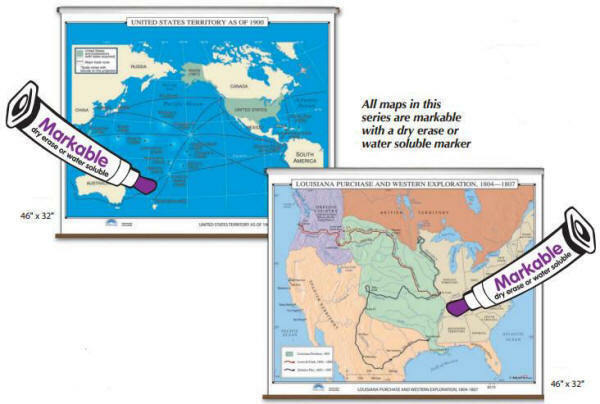 All history maps are eligible for inclusion in custom made map sets. When ordering a pull down map set, please indicate map item number and title in the Special Instructions Section of the secure Shopping Cart. 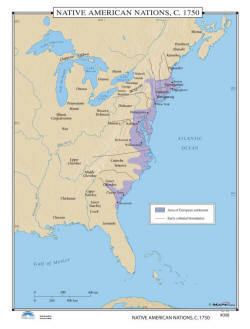 Wall maps are ideal for history buffs as well as for public, private, parochial, and home schools. 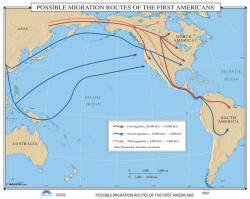 Wall map identifies the Possible Migration Routes of the First Americans, originating in Asia they work through North and South America during three historical periods: 35,000 BC – 18,000; 10,000 BC – 4,000; and 8,000 BC – 3,000 AD. 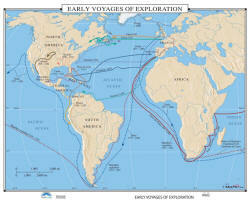 Wall map charts the paths of Magellan, Drake, Ponce de Leon, Cortez, and others, to the New World. Wall map shows where five European groups and key explorers traveled: Norse, Dutch, English, French, and Spanish. The map features the individual routes taken by Cabot, Champlain, Marquette, De Soto, Balboa, and others. 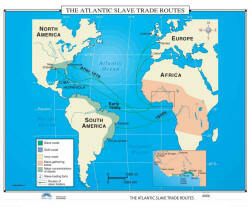 African slaves were not just sold to southern plantation owners in the United States. 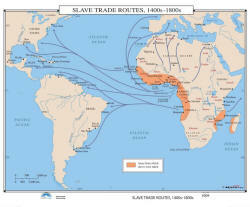 Slave Trade Routes, 1400s – 1800s shows the routes taken by slave traders out of southern Africa. 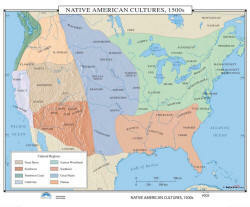 Wall map features the cultural regions of the Native Americans. This map includes shaded relief on many areas, and provides a commanding overview of the entire United States from 1500-1600. The shaded areas on this classroom wall map identify the Slave, Gold, and Ivory Coasts; along with slave gathering areas, major concentrations of slaves, slave trading forts, and the routes of the slave traders. 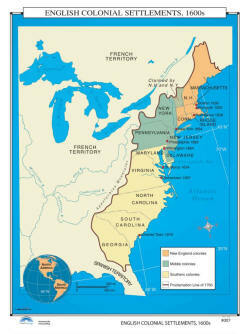 Wall map identifies three major areas of settlement in the new country: the New England Colonies, the Middle Colonies, and the Southern Colonies; and includes the Proclamation Line of 1763. 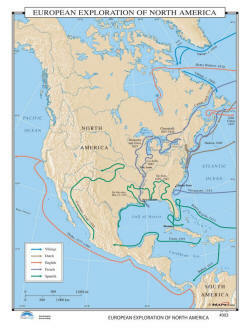 A number of Native American Nations populated the North American continent in 1750. This map shows many of the settlements east of the Mississippi River, along with the primary area of European settlements. 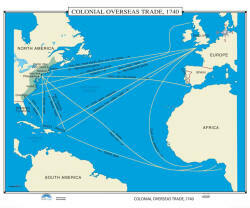 Colonial Overseas Trade, 1740, was very active, with trade running in both directions. North Americans were shipping items like grain, rum, fish, lumber, furs, livestock, and tobacco to the European and African continents. 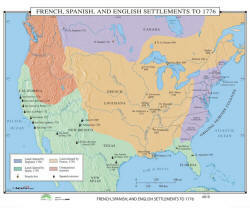 Wall map showcases the areas claimed by three cultures which dominated settlement in North America in 1776.